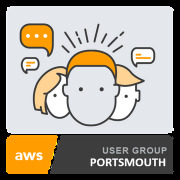 Welcome to the AWS Portsmouth User Group! This group is open to anyone interested in learning more about Amazon Web Services. We're a community of users, developers and business professionals meeting to share ideas & learn from each other and from leading figures in the AWS technology space. Our aim is to become an important resource for technical & business professionals who want to stay up to speed with developments in AWS Cloud and related technologies. We generally have one or two presentations per Meetup. When two presentations are scheduled, each usually go about 30-40 minutes with Q&A.